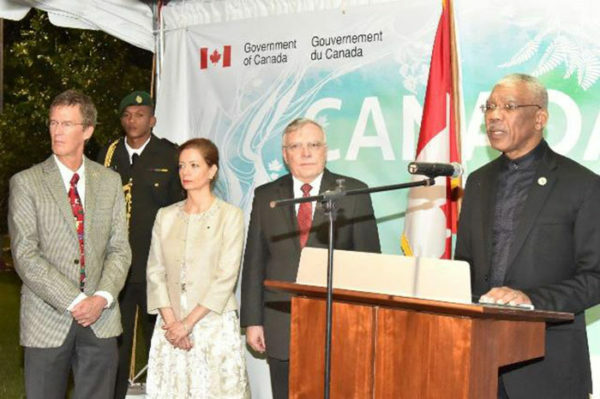 President David Granger on Friday evening extended Guyana’s gratitude to the Government and people of Canada for the firm support he said that country has shown in the face of the ongoing Guyana/Venezuela border controversy. The President was speaking at a reception held to observe ‘Canada Day’. The Head of State said that Guyana remains appreciative of the position, which has been taken by Canada to support Guyana’s stance on the ongoing border controversy, a release from the Ministry of the Presidency said. “Guyana applauds the consistently principled position that Canada has taken in defence of Guyana’s sovereignty and territorial integrity. Guyana welcomes and appreciates this approach, which is a manifestation of Canada’s interest in ensuring respect for the inviolability of international treaties, particularly here in the Western Hemisphere,” Granger said. He noted that ‘Canada Day’ could not have come at a more opportune time as Guyana and Canada are celebrating 50 years of bilateral ties. “It is a happy occasion that this celebration is a coincidence. Not only is Guyana observing its 50th Anniversary of Independence, but 50 years of diplomatic relations with Canada… Relations between Guyana and Canada have been strengthened through increased technical cooperation, trade and development assistance… Canada has been an important ally of Guyana within the Commonwealth. Guyana looks forward to continued collaboration with Canada in international organisations,” Granger said. The release said that Canadian High Commissioner to Guyana, Pierre Giroux remarked that Canada and Guyana share many common goals and characteristics. “We have a longstanding trade relationship that goes back centuries and Canada is also one of the largest sources of foreign direct investment in Guyana. Canada and Guyana share a vision for a more secure and prosperous region, which is why Canada established the Caribbean Regional Development Programme, which includes initiatives that build stronger leadership in the public service, better public finance management, a stronger and more entrepreneurial private sector, improved rule of law and better disaster risk management. Canada and Guyana also share extensive people-to-people ties, with the Guyanese diaspora in Canada estimated to be around 200,000, linking our cultures and peoples ever closer,” Giroux said, according to the press release.